Hi everybody! It’s been a while. Time has flown – Patrick and Adon will arrive in England this Saturday afternoon, and then we spend a day in Ireland, and then the remainder of the week making sure that all the last-minute things don’t get forgotten. Then on Saturday 23rd July, we do a slow lap around Goodwood Racetrack as part of the Festival of Slow, and begin the actual driving part of our journey to Mongolia. Patrick and Adon have had to get concurrent Australian passports because our Iranian visas have taken much longer than expected. We were informed today that the Iranian visas have been approved, so we’re now fully visa-d up for the road ahead. The car has been serviced and we’ve stocked up on most of the essential tools and spare parts. 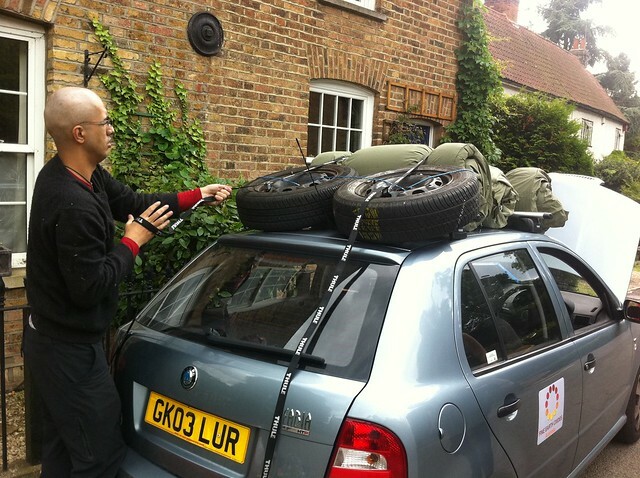 We’ve had roof racks fitted to carry all of our stuff. The mechanic who serviced the car is going to give it a thorough look-over for free on Friday and is getting us two spare wheels (with tyres) on for cheap “from a mate” – giving us a total of three spares. Patrick and Adon purchased swags for themselves and for Cameron – since apparently a swag is not a common camping implement in England. We’ve got ourselves a Carnet de Passage, the legal document required to temporarily import a car into a country and then take it out again. Iran requires one of these. Thanks Iran. Thiran. We’ve procured a wad of US dollars, since from Iran onwards our credit and debit cards are unlikely to be much use. Thanks Iran. Thiran. Cameron bought a bunch of maps, guidebooks and phrasebooks, and ordered a whole lot more from The Internet. Thank you, The Internet. Patrick and Adon are going to borrow some satphones for emergency use from their work. We’ve all committed to mildly outrageous adjustments to our personal appearance which you’ll have to wait ’til you see our photos to find out about. For most of next week, we’re booked into a B&B on the Isle of Wight. When Patrick booked this, he was unaware that the Isle of Wight was actually an island separate from mainland Britain. We may or may not end up changing this booking to somewhere more convenient for rally prep! So, everything seems to be about as under control as it can possibly be for an adventure as mad as this one. Bring on Saturday 23rd!